Year in Review: When Cubs position players reported to Mesa for 2018 Spring Training, David Bote was a nobody. No one outside his family and friends knew how to correctly pronounce his last name. 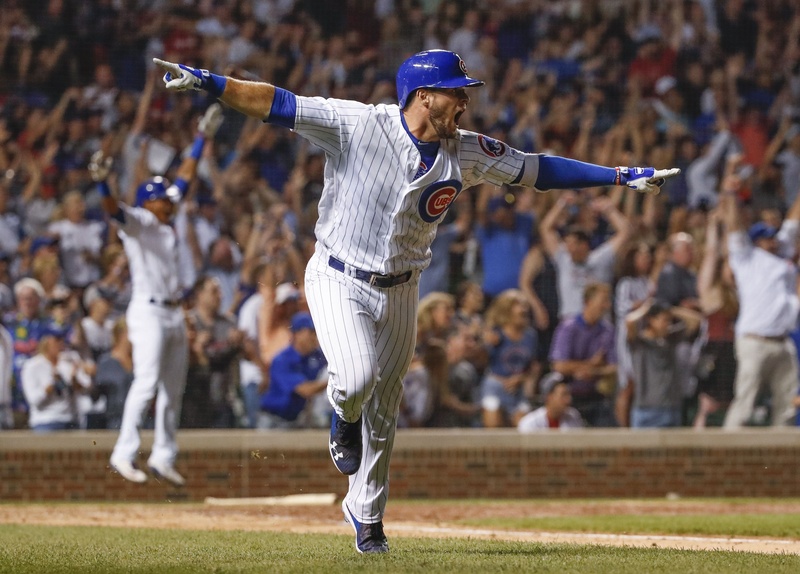 Fast forward seven-and-a-half months, when the Cubs’ season ended after a heartbreaking loss against the Rockies in the NL Wild Card Game, and the 18th round pick in the 2012 draft had established a cult hero status among Cubs fans. Out of his six long balls in his rookie campaign, two were in walk-off fashion. 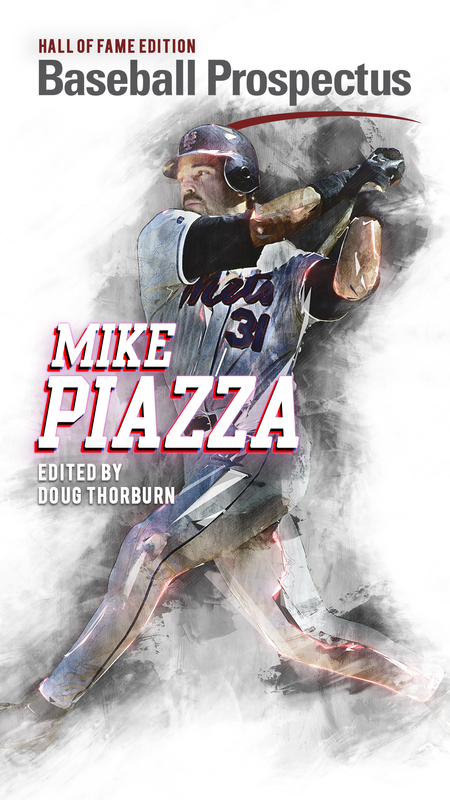 One was the unforgettable grand slam on Sunday Night Baseball to wipe out a three-run deficit in the ninth inning, for which the author was in attendance to witness the ultimate joy. 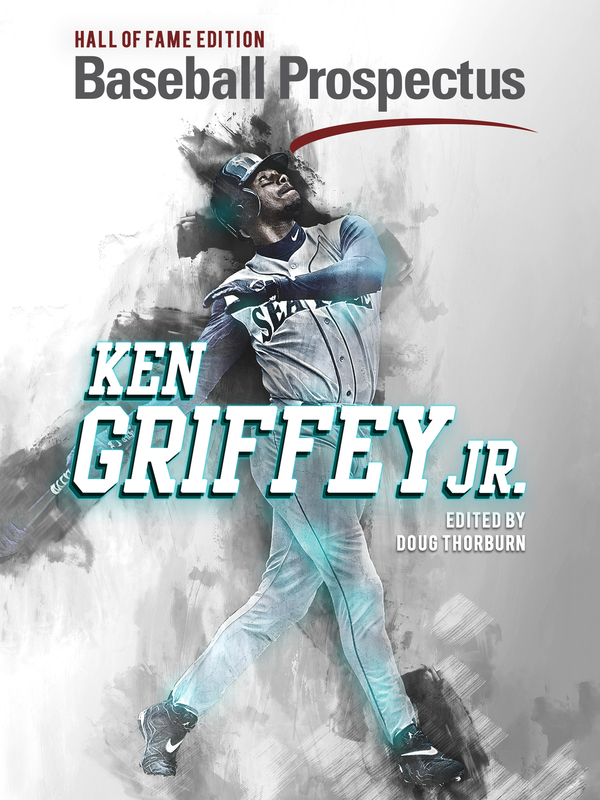 The other, with which he surpassed former baseball hero and current laughing stock Derek Jeter in career walk-off home runs total, came less than two weeks later on Players’ Weekend. 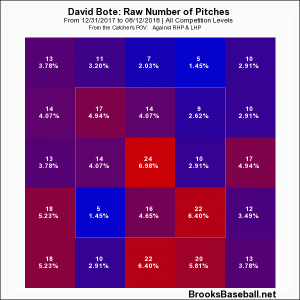 Three other taters Bote mashed in 2018 either tied the game or put the Cubs ahead. In fact, three of the team’s top seven home runs with the highest positive WPA belonged to him. Now, let’s take a look at non-context-related numbers. Among 390 players with at least 100 batted ball events tracked by Statcast, Bote ranked sixth in average exit velocity, with a blazing 93.5 mph. That number placed him within the 98th percentile on the leaderboard, just a tick behind the mighty Giancarlo Stanton. When he put the ball in play, it came off his bat at 95 mph or faster more than half of the time (52.8 percent to be precise). 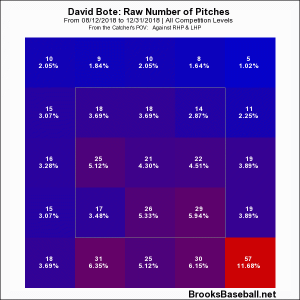 Albeit in a relatively small sample size, Bote showed the ability to catch up to and do damage against major-league stuff. These heroic acts were enough to make the 25-year old a local rookie sensation. More importantly, though, he put together adequate numbers in aggregate by annihilating baseballs and proved that he belonged in the show. Looking Ahead: With Addison Russell’s future in the North Side uncertain, Bote is likely to enter 2019 as the top candidate for the infield utility role. However, there is an area of concern. After August 12, the night he hit the Shot Heard Around Wrigleyville, he was slashing a phenomenal .329/.418/.539 in 91 plate appearances. After that night, his numbers plummeted to .179/.244/.315 in 119 plate appearances the rest of the season. I suspect the culprit to be the opposing pitcher being more careful against him. As you can see in the charts above, Bote saw a fair share of pitches inside the zone—and a lot middle-middle—until the grand slam. Since then, pitchers have started to avoid the heart of the zone, and threw the majority of pitches too far down and away. It worked for them, as his chase rate jumped from 28.9 percent to 32.5 percent, and his O-contact rate slipped from 61.1 percent to 37.2 percent. Yes, I know I’m digging into a tiny sample size here, but this is something he can work on. Pitchers will attack him this way until he can adjust. If he makes those adjustments, he could become something more than just a bench bat for the next several seasons. Kaz is obsessed with the unpredictability within the game of baseball. You'll probably find him posting some mind-boggling tidbits from Play Index on Twitter. In his spare time, he enjoys playing guitar with his 20-grade strumming skills.